Mouni Roy slammed the Jet Airways for their rude behaviour and requested the airline to not to hire people who are venomous to other people. Television actress Mouni Roy, who made her acting debut in Bollywood with Akshay Kumar’s period sports drama Gold last year, seems to have had an unpleasant experience with the services provided by Jet Airways. 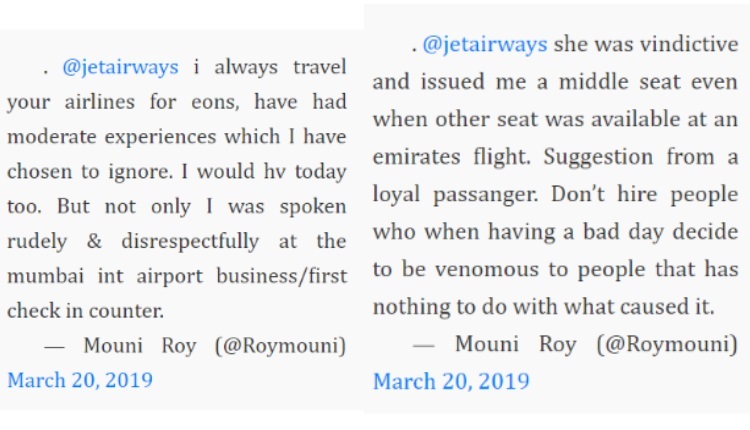 Yes, taking to Twitter, Mouni Roy has slammed the Jet Airways for their rude behaviour and requested the airline to not to hire people who are venomous to other people. The ‘Naagin’ actress has expressed her anger over their services and posted a series of tweets which now have been deleted by her. Mouni is gearing up for her next Bollywood film ‘Romeo Akbar Walter’ opposite John Abraham, whose second song ‘Jee Len De’ has recently released. The story of the film revolves around an undercover spy played by John Abraham, who goes by different names and identities. Jackie Shroff plays his handler, who prepares him for a special mission ‘that could change the course of history for India’. On the professional front, Mouni Roy will next be seen in Alia Bhatt and Ranbir Kapoor starrer ‘Brahmastra’, the beauty will be portraying a negative character for the first time. Ayan Mukherji’s ‘Brahmastra’ also features Amitabh Bachchan, Ranbir Kapoor, Alia Bhatt and Akkineni Nagarjuna in the lead roles. Apart from these, the gorgeous actress has recently bagged, ‘Made In China’ opposite Rajkummar Rao and ‘Bole Chudiyan’ opposite Nawazuddin Siddiqui.